How should climate change be taught? The external release of documents relating to the activities of the Heartland Institute has raised many questions, but an important issue that is now in the open again relates to the teaching of climate change in schools. How should this be handled and what should be taught? Is there justification in arguing that “both sides” of the issue should be covered? Are there “two sides” to this issue? If so, what exactly are the “two sides”, particularly in the context of a high school education? My own experience with this issue is through the education of my son (now in his second last year of school in the UK). Climate change has seeped into a very wide variety of his subjects over the years, including chemistry, biology, geography and now economics. The message has been pretty consistent over time, i.e. “we are changing the composition of the atmosphere, that will have implications for future generations and here are some of the things that we might have to deal with.” This has resulted in a person with a pretty balanced view of the issue and some good insight into the economic thinking that supports carbon pricing within an economy. He is far from a climate zealot (not at all in fact) and is prepared to question the material he is presented with – which in turn leads to some interesting discussions between us. But I remain unconvinced that the basic science has been taught with rigor, at least to the extent that there is a reasonable understanding of the atmospheric physics / chemistry at work. More focus on this aspect of the subject could do much to settle the issue of “both sides”. At least at this level there simply aren’t two sides. We know the earth behaves as a black body, we know that Plancks law applies to black bodies and even in high school it is possible to demonstrate that this doesn’t give us a correct answer for the calculation of the surface temperature of the planet (and I remember doing Planks Law in final year school physics myself). This then leads to an understanding that other processes are in play (trace gases in the atmosphere) and that we are now influencing those processes. One of the difficulties with this subject is that it starts from a very small fact base of core physical principles and grows almost exponentially in both complexity and uncertainty. We then end up making very uncertain connections at the top, which not surprisingly raises the ire of some people. For example, there is plenty of imagery that links driving cars, flying in an aeroplane or even turning on a light with the threat of survival of polar bears (just to pick an example). . . . . and so on. Physics and chemistry today have delivered a high level of certainty regarding the behaviour of CO2 molecules in the atmosphere. But the fate of the polar bear is highly uncertain as are the precise causes of all the changes in its habitat. Yet, at least for younger students we tend to start with material that has high imbedded uncertainty and teach it as if it is fact, which of course it isn’t. This then leads to the call from some members of the community to present “both sides” of the issue, when in fact there aren’t any sides at all. The “both sides” call is then also interpreted by others as evidence that there is interpretation and uncertainty at the core of the issue, i.e. with the physics that underpins it, when in fact there is very little uncertainty. In a posting in July last year I recalled the speech given by Nobel Prize winning atmospheric chemist Mario Moilina (who unraveled the chemistry of CFCs and ozone) at an MIT event, where he started by saying “Since when was the Stefan Boltzman constant in dispute?” In fact it isn’t in dispute at all and we know with great precision how our planet radiates in the infra-red. This issue isn’t just about school education, but also pertains to the education of the general public when it comes to establishing climate policy. It’s the same problem that occurs when a particular weather event is linked to CO2 emissions. I am not a professional educator, but this line of reasoning seems to point to the need for the teaching of climate change issues at a much later point in the school curriculum and focusing more on the underlying science earlier on. We don’t teach maths by starting with chaos theory, calculus and complex numbers, rather we start with basic numerical techniques, then algebra, trigonometry and so on. This should perhaps also be true for climate change. The well understood processes that underpin the issue should be taught as a lead-in to the much broader discussion. Then at least the students can think about and debate the “two sides” for themselves. There certainly are more sides. The science is about competing hypothesis. IPCC tried very hard not to dilute the message so they censored these competing hypotheses. E.G Svensmark’s theory can explain a lot of observed warming during the past centuries. This theory is censored form IPCC and from schools. It is also a common practice that alarmists (and fraudster Peter Gleick was one of them) try very hard to keep competing hypothesis out of peer –review and if it comes through they target scientific journals publishing such papers. This happened several times in the past. Teaching competing hypothesis would be beneficial to introduce young people into the normal scientific process early in their lives. Not to the IPCC parody. One person challenging status quo is much more important than thousands of nodding ones. If you can’t silence such persons with very good evidence than your consensus is useless. The history shows us that it was these individuals who are pushing the science forward. Regarding the drowned polar bears I thought this was confirmed fraud. In reality those drowned bears were found after the single storm and were counted form the plane. I leave David to check the facts. If you are wrong on such a small thing how can anybody believe you with something much more complicated as future climate forecasting? Perhaps you were exposed to consensus “science” only during your studies? I am in complete agreement with your conclusion. I would also suggest that the subject should be approached with confidence regarding what we KNOW and humility regarding what we THINK we know, once the students understand the difference between a law, a theory and a hypothesis; and, the difference between DATA and MODEL OUTPUTS. Ed has touched on something very important. Adepts to science should understand the basic terminology. 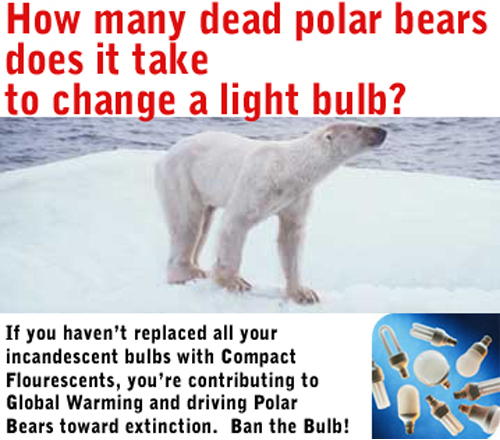 Let’s take the example of those unfortunate drowned polar bears. The DATA said that certain amount of dead polar bears was found on the beach. Author creates a HYPOTHESIS that polar bears drowned due to increased distances they have to swim between the icebergs. This is supportive to the anthropogenic global warming THEORY which is described by climate sensitivity LAW (doubling of CO2 concentration brings certain amount of global warming). This LAW is just brief a extraction of the said theory with MODELs based on mentioned THEORY predicting runaway global warming threatening the whole biosphere. Now, there is still something important missing – the REALITY. What is the real status of polar bears in the Arctic and climate on the Earth? Do we have any scientific tool how to investigate? Certainly we do. We can formulate ALTERNATIVE HYPOTHESIS. We can investigate the DATA, formulate alternative hypothesis, alternative theories, alternative models. The only way how to decide which theory is correct is to compare it to the observations during the process called test of the hypothesis. E.g we can compare models predictions. Does AGW theory explain current lull in the global warming? Does AGW theory explain why the northern and southern hemispheres were warming in different rates? Why there are temperature fluctuations in Holocene? Finding observation which can’t be explained by the theory gives an indication that the theory is not valid as it is and has to be reformulated. I described a classic scientific process. It is true this process was excluded from IPCC and as far as I know it is not normally taught at primary or secondary schools. In my case I was first introduced to this kind of thinking at university when studying basics of theoretical mathematics. Even then it was more about drilling formalism and established theory. However, imagine those individuals who weren’t exposed to this knowledge at all. Should we make above a part of secondary school curriculum or should we wait longer? I would support introduction of scientific principles as soon as practically possible.